Posted on July 1, 2016 by Norwich Radical	in Community, Inter|national and tagged accelerated growth, Audit Commission, bottom up, Breckland, budget, business, Cities and Local Government Devolution Act, conservative, council, democracy, devolution, east anglia, economy, elections, English devolution, george osborne, government, grassroots, Great Yarmouth, growth, LEP, local council, Local Enterprise Partnership, local government, Lutfur Rahman, Martin Winter, mayor, norfolk, North Norfolk, norwich, public sector, Suffolk, Tories, trade union, Treasury, turn out. “Let local people decide!” urged George Osborne in his budget speech last summer, as he announced details of his plans for English devolution. What an excellent idea, as, on the face of it, almost everyone across the political spectrum agreed. Unfortunately, local people did not ask for devolution, had no say in deciding its form or content, were kept entirely in the dark about negotiations, and, in the case of East Anglia, are now to be ‘consulted’ on a deal of whose existence they are probably unaware and which, the Treasury has confirmed, there will be no opportunity to amend. Report after report, from councils, public sector bodies and journalists, has enthused about the ‘golden opportunity’ to give local people a say in the decisions that affect them. Even those expressing serious reservations have praised the ‘principle’ of devolution — ignoring the glaring fact that when you examine the detail of the Cities and Local Government Devolution Act, or of individual ‘deals’, this principle is conspicuous by its absence. The proposals differ by region, but what they all have in common is a relentless, tunnel-visioned focus on ‘accelerated growth’, and a governance structure consisting of a combined authority and an elected mayor. The mayor will have the power to make decisions on transport, planning, post-16 training and other strategic priorities — with more powers promised later if they succeed in pleasing their masters at Whitehall. It will take a two-thirds majority of the combined authority to overturn a decision taken by the mayor. The government has made much of the fact that these mayors will be ‘accountable’; but look a little more closely and it becomes clear that the supposed accountability stems only from the fact that the mayor will be directly elected. This is a sadly impoverished definition of accountability. Real accountability means every decision a politician makes being subject to proper scrutiny, not just an election every four years — particularly when, if past mayoral elections are anything to go by, only about a third of people will turn up to vote. The combination of low turnout, far-reaching powers and little scrutiny is a dangerous one. It always risks a situation such as that in Doncaster, which elected first Martin Winter, who ignored a series of votes of no confidence, and then Peter Davies, remembered mainly for his persistent attacks on minorities and an infamous comment in praise of the Taliban. In 2010, central government stepped in to run the council after the Audit Commission declared it ‘dysfunctional’. In 2014 it also intervened in Tower Hamlets, where now-disgraced mayor Lutfur Rahman’s fraud, corruption and divisive rhetoric had been allowed to continue with impunity since his election in 2010. Mayoral powers allowed Rahman to sell off council assets on the cheap to his allies, and personally allocate all grants of more than £1,000 — essentially buying residents’ votes. A system of over-powerful elected mayors invites these kinds of bigots and megalomaniacs to put themselves forward, and then provides very few checks and balances. The proposed combined authority for Norfolk and Suffolk would consist of the leaders of all the district and county councils, the mayor, and the chair of the Local Enterprise Partnership (LEP). This would lead to an almost exclusively Conservative authority, with no voice for the constituent councils’ opposition groups. Like pesticides in the food chain, the concentration of Tories increases dangerously the higher up you go. Like pesticides in the food chain, the concentration of Tories increases dangerously the higher up you go. As unelected bodies, the presence of LEPs on combined authorities is something of a new departure in British governance: unelected businesspeople as voting members on a statutory authority. It is a scandal, and one that has slipped by almost unnoticed. Why a representative from business, but none from the trade unions, the voluntary sector, environmental pressure groups, or indeed any number of other special interest groups? The answer, of course, is Growth — that unseen deity at whose sprawling concrete altar we must all worship. The language of the Norfolk and Suffolk devolution proposal is striking in its unrelenting insistence on economic growth as the ultimate goal. Even the section on preventing flooding (the deal’s sole acknowledgement of the natural environment in any form) states that we need to manage flood risk in order to ‘deliver additional economic growth’ and ‘unlock new business development opportunities’. We have reached an absurd state of affairs when simply preventing flooding isn’t seen as a valid goal. The economy exists to serve the needs of people, not the other way around; and yet economic growth for its own sake has become the principal goal. Citizens, in this vision, are simply a resource for boosting the economy; improvements in their lives are seen as merely a means to an end. This Tory stitch-up of a devolution settlement is just another excuse to siphon off more money for the private sector to ‘stimulate growth’, while further eroding the role of local elected representatives. Those who back the deal for Norfolk and Suffolk have mainly cited the money on offer. Cash-strapped councils are desperate not to be left behind in this race that Osborne has forced them to enter. But the only new money is £25 million a year between the two counties, guaranteed for five years, plus a similar amount for housing. ‘Subsequent five-year tranches of funding will be unlocked if Government is satisfied that independent assessments demonstrate that the investments have met the objectives and contributed to national growth,’ states the deal, ominously. In other words, areas that are struggling economically will have their funding cut. This conditional approach to funding local government runs counter to the whole purpose of the state, which exists to protect the vulnerable and ensure the excesses of capitalism leave no one cut adrift. In other words, areas that are struggling economically will have their funding cut. The good news is that a growing number of local councillors are starting to see through the Tories’ claims. 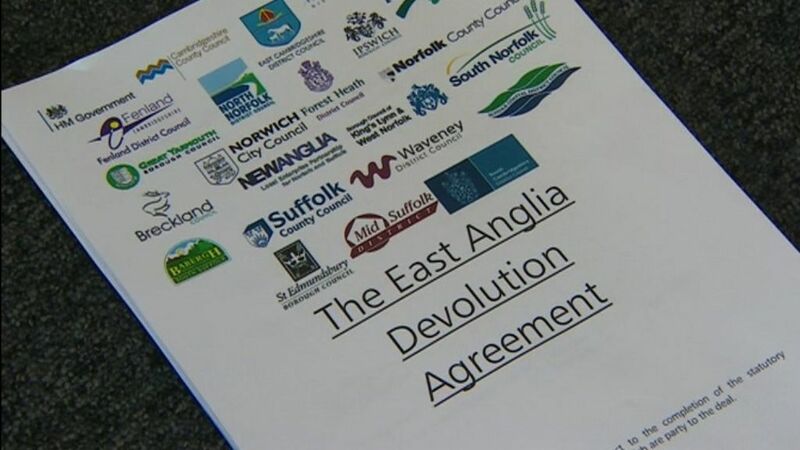 Four Norfolk councils — Norwich, Breckland, North Norfolk and Great Yarmouth — voted against the devolution deal this week, arguing that the promised funding was inadequate and the structure undemocratic. Yet the Treasury has vowed to press on. Just as they did with the living wage, the Tories have taken a valuable and necessary concept and mutilated it for their own ends. As with the living wage, people who have long argued for real devolution find the language of their campaign hijacked and rendered unusable. Local authorities are being forced at gunpoint to accept a deal that will eventually kill them off anyway, with Whitehall doling out the money and public participation never remotely on the cards; and all this in the name of devolution. The remarkable thing is that so many commentators have been fooled by the label; fooled into believing that a Tory government which has slashed councils’ budgets, taken schools out of local authority control and decimated council housing suddenly believes in local government, and wants to create more of it. ‘Devolution’ for Norfolk has most likely gone away, for now — it is hard to see how it could possibly be forced through with only four out of eight councils on board. We must be on the watch both for its return and for any signs of our county being disadvantaged after its districts dared to defy the Treasury. Meanwhile, let’s start a conversation about what real, bottom-up devolution might look like. ← WHAT IS DONE CANNOT BE UNDONE. WE ARE THE ARCHITECTS OF OUR FUTURE. We need a wider circulation of articles like this.